I started the hike between 7:30 and 8:00 am on a cool morning (about 38 – 40 degrees) during the third week of December, 2009. It was a little chilly at first, but I quickly warmed up. I’ve hiked in Big Bend National Park many times before, but as this was my first solo trip, the sign at the trailhead warning of an aggressive mountain lion in the area wasn’t exactly comforting. Even in December, the Chisos Mountains are beautiful and I made reasonable progress in spite of frequent stops to take photographs. I was fortunate enough to see several deer on the trial shortly before I stopped for a long lunch. I rested and ate at the South Rim and thoroughly enjoyed the view. The trip back out to the Pinnacles, like the trip in via Laguna Meadows, was very enjoyable. By mid-afternoon, the temperature was about 70-72 degrees and felt even warmer. I don’t think I met more than 4 or 5 other hikers during the trip and I really didn’t mind the solitude at all. The last couple of miles is mostly rocky and a fairly steep decent, so my 54 year-old body definitely felt the result of that pounding the following morning. I shot almost as many photos on the return trip as I did coming out, so I didn’t get back until after 4:00 pm, but considering the view, I really didn’t care. It was a great hike and I never even caught sight of the mountain lion the sign warned of. I strongly recommend the South Rim trail. I hiked the Upper Canyon trail on a warm, muggy day in May of 2009. It’s a nice area and an enjoyable hike, but by that time of year, it’s starting to get warm, so begin the hike early. The views from Haynes Ridge are great and Fern Cave is also interesting, so bring a camera with you. I saw quite a few lizards, but no other wildlife. The only other people I saw were a couple of mountain bikers shortly before I returned to the parking lot. My timing turned out to be pretty good, because the area was hit with a huge thunder storm an hour or less after I finished. By that time, I was ordering pizza and a cold drink in a small town about 40 miles (or so) west of the park. It was a good hike, but probably better in the cooler months when heat and storms aren’t a concern. 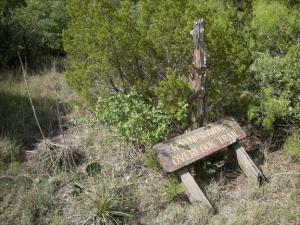 Before hurricane Rita, the Sawmill trial in the Angelina National Forest was probably a beautiful, easy 10 mile hike. Last year (2006), it was serious obstacle course and large sections of the trail had disappeared completely. This was due to severe damage from Hurricane Rita. Hiking this trail since Rita hit leaves you climbing under and over thousands of huge, uprooted trees or crawling up the muddy banks of several creeks. Most of the bridges are destroyed and many areas are just plain unsafe. If you cannot use a compass or at least carry a GPS receiver, you could easily get lost. The worst part was that there was no notice posted at the park warning that the trail is closed (we went in early February 06'). There was also no warning on the web site of the Forest Service. As a matter of fact, the only warning sign we saw at the Angelina National Forest was one indicating that a single road (inside the park) was closed. It stood just beside another side pointing to an alternate trail head. One two-mile section of the Sawmill trail took us 5 hours to get through. The following 5 miles took only 2 hours. If you want to go, give them time to get it cleaned up (maybe some time in late 2007 or 2008). One more thing, there is no cell phone coverage in just about any direction for nearly 20 miles. If your car breaks down inside the park like ours did, you’ll either have to hitch a ride or plan on walking about 25 miles to Jasper. After we returned, I sent an email to the Forest Service and since that time, they have made note on their web site that the Sawmill trail is closed. They should probably indicate the entire area is closed, but some warning is better than nothing.